The fall of France and the subsequent siege of Britain created a situation that was in effect the one for which the newest of the American strategic plans had been designed. Based on the assumption of a complete German victory in Europe, which would burden the United States with most of the weight of defending the Western Hemisphere, this new plan -the RAINBOW 4 plan- provided for taking into protective custody the Old World possessions in the New World on the ground that Hitler would otherwise grab them up as spoils of war.1 The plan contemplated the organizing of a Caribbean theater of operations as a major measure of defense, one that would in fact serve the dual purpose of furthering the southerly orientation of RAINBOW 4 and of protecting the Atlantic approaches to the Panama Canal. While subsidiary RAINBOW 4 plans were being laid, the President and his advisers were arranging the details of the destroyer-base exchange with the British Government. As soon as the exchange took place a survey of the prospective base sites in the Caribbean area -British Guiana on the southern periphery, Trinidad, St. Lucia, Antigua, and Jamaica- was undertaken by an Army-Navy board and preparations for developing the bases were begun. The structure was not built without disagreement. The controversial questions were principally the co-ordination of operations with the Navy, the precise grouping of local commands, and the organization of a Caribbean air force. Although official policy held that "operations of Army and Navy forces will normally be coordinated by mutual cooperation," it was the standard and accepted Army doctrine that only unity of command would provide the "unity of effort which is essential to the decisive application of the full combat power of the available forces." 6 The contretemps that had occurred at the time of the June 1940 alert, when by error the Panama Canal Department sent a "directive" to the Fifteenth Naval District, demonstrated what ought not to happen. It must have immeasurably strengthened General Marshall's conviction that unity of command was required without further delay, but General Van Voorhis, perhaps because of his close personal relations with the local naval commander, preferred the old official policy of mutual co-operation. "A gradual approach along cooperative lines," he wrote to General Marshall, "will result in joint effort without raising the question of command. Personally I feel that the question of coordinating all activities under a single head will have to be determined," he concluded, "when the emergency arises." 7 He had raised the question in June, when, during what appeared to be an emergency, he thought that the means for carrying out his mission were lacking and could be most easily provided by the Navy. Every time the same issue was raised elsewhere -in Bermuda, Newfoundland, Alaska, and Iceland- the circumstances were the same: one commander was looking with longing eyes at the means under the control of another. Since the question was essentially one of policy, discussion of it most of the time took place beyond the range of the local commanders. No solution was reached in Washington until the Pearl Harbor attack, when unity of command was established at Panama and Hawaii by fiat. The problem then was transferred to the operating levels. The same problem that had faced the Panama Canal Department now confronted the larger theater. Whether the tactical defenses should be organized along lines similar to those of the administrative organization and assigned to the sectors or be placed in a theater-wide functional grouping under a single commander was the question. The specific issue concerned the air units. On opposite sides of the question were ranged General Van Voorhis and the commander of his air forces, Maj. Gen. Frank M. Andrews. alerted by the elaborate ground warning network. Ideally, as the air forces saw it, the antiaircraft artillery would be closely tied in with the interceptor forces, and the whole would be commanded by the air commander. General Marshall, in a personal letter to General Van Voorhis on 4 January, referred to the question of co-ordinating the air forces as being "exceedingly important" and requiring "very special treatment." He had sent General Andrews to Panama, General Marshall wrote, so that "a very competent man" would be available for this purpose; and "as soon as the new air units begin to arrive in the Caribbean region," he continued, "the matter of coordination of air affairs will demand immediate treatment." 10 But then General Marshall went on to say that he felt that current plans provided for too many air units to be accumulated on permanent station in the Caribbean, since air units could be deployed rapidly when needed, if airfields and facilities were available. He suggested that, after the minimum garrisons were decided upon, air units located in the southeastern United States be tagged as reinforcements and that, instead of being stationed in the Caribbean, they might make a swing around the region three or four times a year. He admitted, however, that "the Staff" in Washington did "not seem to agree" with him on this. General Marshall then proceeded to discuss command between Army and Navy, in the midst of which he added, "but there can be no question but what all of the Air activities must be coordinated by a single head." of other Japanese ships, arrived at Cristobal during the next few days, but, when the ban was continued, they were rerouted either via Capetown or by way of Cape Horn. By 22 July no Japanese vessels remained at the Canal Zone.26 The few ships that had been inspected in United States ports had proved to be free of any threat. Before the month ended, the Japanese move into Indochina provided a clue to the activity that had aroused American suspicions, and the subsequent freezing of Japanese funds in the United States brought a cessation of trade between the two countries that made the Canal restrictions superfluous. military mission to Surinam for the purpose of co-ordinating defense measures and discussing the security of their common boundary. This formula was accepted by the Brazilian Government, and the War Department began making arrangements to send the troops about 9 November. But because of dissidence on the part of one or two members of the Netherlands Cabinet, the start of the operation was delayed another two weeks.30 On 25 November a headquarters party flew into Surinam, and three days later the first echelon of the force arrived off the harbor of Paramaribo. On 3 December 1941 the remainder of the ground troops landed, and on 8 December the air unit arrived with three B-18's and seven P-40 fighter planes. was out, permission to build bases in the Galapagos Islands had been obtained from the government of Ecuador, negotiations for similar bases at Salinas, Ecuador, and Talara, Peru, were under way, and a squadron of Army bombers had begun operating from airfields in Guatemala. Thus a semicircle of defense similar to that provided by the Antilles was constructed in the Pacific. The question of acquiring bases on the Galapagos Islands had made one of its periodic appearances at the beginning of the year. At that time the War Plans Division had taken the position that nothing should be done unless the President expressly directed it and unless an outright lease was obtained from the government of Ecuador. If these conditions were met, the War Plans Division agreed that assistance should be offered the Ecuador air force in return for use of a base in the Galapagos Islands.32 During the following weeks reports filtered in from South America that the government of Ecuador would not be averse to ceding a base on the islands to the United States.33 At this point, in the spring of 1941, the question was still considered primarily a matter for the Navy Department to act upon, just as it had been three years earlier. Although definitely related to the defense of Panama, a base in the Galapagos fell within the Navy's responsibility for offshore patrol. The Army was officially concerned only to the extent that the base would have to be defended. When the question of developing a base in the Galapagos and of building up an outer ring of defense around the Pacific approaches to the Canal had been raised, in January 1941, the inner defenses were still concentrated in the Canal Zone. Negotiations with the Panamanian Government for defense sites outside the Zone had reached a standstill. In the year and a half since the ratification of the Panama treaty, the number of defense sites of one sort or another that the Army wanted to acquire in the Republic of Panama had risen from ten or so to more than seventy-five. The principal reasons for the delay in the negotiations were the term of the leasehold and the question of jurisdiction. A new administration which had taken office in Panama was inclined to grant a lease for such bases only for the duration of the emergency, while the United States desired to negotiate a long-term lease with an option to renewal, using the Rio Hato lease as a model. On the question of jurisdiction, the United States took the position that for the period of the lease it should have exclusive jurisdiction and police authority over all persons within the leased areas 45 In London, at this same time, the commissioners who were negotiating a base agreement with the British Government were facing a similar situation. permit the military authorities to occupy the various defense areas and to begin construction pending the conclusion of a formal agreement. A joint board was to be set up for arranging details of the transfer. Although General Van Voorhis was reluctant to take over any sites unless he could do it unconditionally and with full authority, a decision to go ahead was made on 24 March. During the following week instructions to this effect were sent to General Van Voorhis and the American Ambassador in Panama, and a schedule of dates for taking over the sites, which General Van Voorhis had drawn up, was given to the Panamanian Government.48 By 12 April 8 of the 12 airfield sites that had been considered necessary were taken over and occupied, and two of the seven AWS stations had been transferred but not occupied. During the next five weeks 1 or 2 additional landing field sites were acquired, and apparently no request was made for the transfer of any other sites. To the State Department, which all along had been urged to make haste in obtaining an agreement with Panama, it seemed that now an agreement had been reached the War Department was dragging its heels. However, an exchange of messages with General Van Voorhis convinced the War Plans Division that "every effort" was being made "to take over and occupy defense sites expeditiously.49 By the end of 1941 about 40 defense sites had been occupied by American troops, and eventually-the number rose to more than a hundred. A lack of roads and other facilities rather than any procrastination on the part of the Army or the Panamanian Government made the process slower at times than it might have been. Except for the entry of the United States into the war, the change most pregnant with consequences was the signing of the formal agreement on defense bases, which took place on 18 May 1942. Although progress had been made in actually acquiring the sites, a formal agreement setting forth the rights and privileges to be enjoyed by the United States had been avoided by the Arias regime. Negotiations had continued during the summer and early fall without much progress being made. At the end of September the draft of an agreement, which offered no substantial concessions to the Panamanian point of view, was sent to the American Ambassador for submission to the Panamanian Government on 8 October, the very day on which the Arias government was overthrown. The draft reached General Andrews' headquarters on 1 November, but by then it was becoming clear that the new Panamanian administration could not retreat far from the position taken by the Arias government.51 Discussions, counterproposals, and more study finally produced on 27 March 1942 a second draft that incorporated certain compromises. This draft formed the basis of the approved agreement signed in Panama on 18 May. As finally accepted, the agreement was to terminate within one year after "the definitive treaty of peace" was signed, and if the situation at that time was such as to require the continued occupancy of any of the defense bases, a new agreement would be concluded. The United States was given exclusive and full jurisdiction over its own civilian and military personnel within the leased areas and the right to arrest, try, and punish anyone committing crimes against the safety of the installations, except that Panamanian citizens arrested on any charge had to be turned over to Panamanian authorities for trial and punishment. For all lands leased as defense sites the United States agreed to pay to private owners an annual rental of $50.00 a hectare and for public lands $1.00 a year for all of them except the Rio Hato area, for which the annual rental was to be $10,000. The United States also agreed to assume the expense of completing the Pina-Rio Providencia highway and the Madden Dam bypass into Panama City. 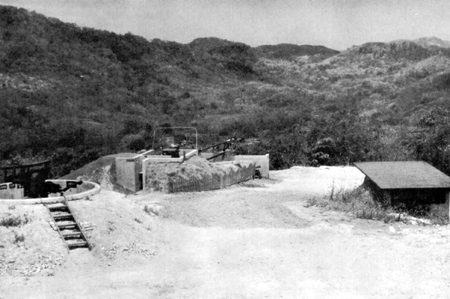 ANTIAIRCRAFT DEFENSES OF THE PANAMA CANAL. Barrage balloons along the canal (top). A 40-mm. antiaircraft gun in position (bottom). One of the reasons why additional base sites were necessary was the rapid increase in the Panama garrison in the last three months of 1940. During this period the strength had risen from about 21,500 officers and men to approximately 28,000, an increase of slightly more than 30 percent. During most of the following year, 1941, there was only a gradual rise. In January the garrison stood at about 28,700; in November it totaled approximately 31,400. This was where it stood at the end of the month when the situation in the Pacific began to cloud over. In addition to the Panama and Puerto Rican garrisons there were approximately 4,800 men in the new bases acquired from the British-in Jamaica, Antigua, St. Lucia, Trinidad, and British Guiana-and in Surinam. The largest of the outlying garrisons was the one in Trinidad, which totaled about 2,000 men. Thus, when the Japanese attack on Hawaii came, there were nearly 58,000 troops on guard in -the Canal Zone, in the Republic of Panama, and along the vast arc that stretched from Surinam, north along the Antilles screen, to the Yucatan Channel.60 Their mission was not simply to keep the Canal open but to defend the entire area. It was a task shared with the Navy. The obvious necessity of extending local naval defense beyond the existing limits of the Tenth Naval District (Puerto Rico and the Virgin Islands) and the Fifteenth (the Panama Canal Zone and adjacent waters) and the need of co-ordinating activities with the Army on a broader basis than that afforded by the naval districts led Admiral Stark, Chief of Naval Operations, to propose the addition of two new coastal frontiers to the four already provided in Joint Action of the Army and the Navy. He suggested that a Caribbean coastal frontier be organized to include the southernmost of the Bahamas, the eastern half of Cuba and all the rest of the Antilles, and the northeastern coast of South America between Colombia and Brazil; and that a Panama coastal frontier be organized which would include both the Caribbean and the Pacific coasts of Central America, both coasts of Colombia, and the coast of Ecuador. The Galapagos Islands, Cocos, and all the other islands off the Pacific coast were to be included also. This much of Admiral Stark's proposal was far from revolutionary. The Army-Navy Joint Planning Committee, then engaged in revising the RAINBOW 5 plan, accepted the two coastal frontiers as geographical definitions, and the Navy organized them as naval commands. ing to General Andrews, it ignored the primary defense problems of the area, namely, the problem of air defense. If the Navy proposals were accepted, two Army air forces would be required in the Caribbean area, he predicted, and the organizations for maintenance, supply, and communications would become complicated and duplicating. The proposal, General Andrews commented, assumed that the two major threats were from the west and the east and overlooked the likelihood of an attack from the south along the Trinidad-Panama line.62 For the all-around defense of the area against any threat from any direction, the existing organization, namely, the Caribbean Defense Command, was sound and logical, General Andrews contended. He "agreed in principle with the desire of the Chief of Naval Operations to achieve a unity of command, but he believed that the method proposed was foreign to the problem at hand . . . ." 63 His conclusion was therefore that "naval support must be regarded as an adjunct to the existing army organization and should pass to army control when assigned or requested" and also that the naval districts in the Caribbean area should be so organized and commanded as "to permit coordination of naval supporting forces by the Caribbean Defense Commander through the principle of unity of command." 64 The situation offered some proof that when an irresistible force meets an immovable object the result could be a transmutation of both into gaseous nebulae. tions the Caribbean side of the Isthmus gave Army authorities in the Canal Zone less concern than the exposed position on the Pacific side. 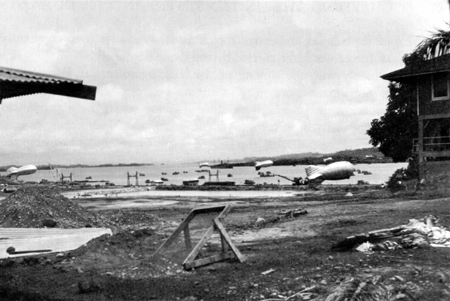 In Panama, only a bare beginning had been made to provide the eventual bases for air coverage over the Salinas-Galapagos-Guatemala patrol arc. In order to fill the gaps in the arc, additional airdromes at Tehuantepec, Mexico, and Talara, Peru, were considered desirable; but, except for limited improvements to the existing field at Talara, which the Peruvian Government had been persuaded to undertake and which were started in the late fall of 1941, nothing had been done to establish these additional bases by the time the United States was drawn into the war. 65 In contrast, the defensive screen in the Caribbean had been tightened by the acquisition of the new base sites in British territory. Whereas the Army commanders in Panama had repeatedly, but without avail, urged the extension of the defenses in the Pacific, the authorities in Washington were more interested in developing and fortifying the new Caribbean bases. This interest stemmed in part from considerations other than the direct defense of the Canal.